Gary Dempsey, the principal at Pelham High School, starts the 20-hour journey to Houston Friday morning. Principal Gary Dempsey of Pelham High School in New Hampshire had the idea to send not only household items, but an actual house, to a family in Texas impacted by Hurricane Harvey. Donations are pouring in from across the country to help victims of Hurricane Harvey in Texas, but one New Hampshire man had an idea to do more than just send aid. The Pelham community is coming together to give one Houston family a whole new start. At Pelham High School, there’s a steady stream of donations for those hit hardest by Harvey. “They have absolutely nothing,” said senior Alyssa Janak. It started a few days ago, when Principal Gary Dempsey had an idea to send not only household items, but an actual house. 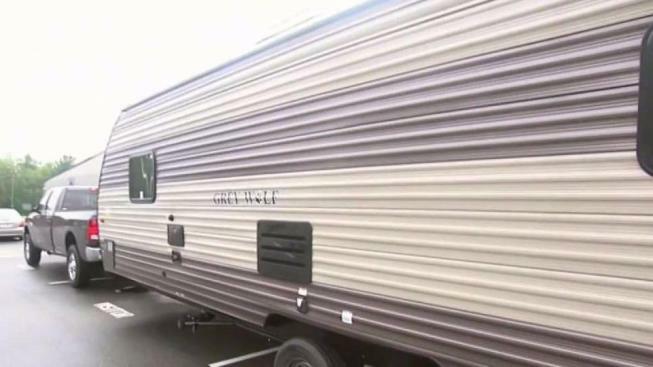 The camper is like a one bedroom, full bath apartment with a kitchen, complete with a generator and now filled with necessities to help one family start over. “It’s inspiring,” Dempsey said about the outpouring of support. “The donations that came in were just incredible, people just want to give back,” said Tracy Musto whose company Liberty Utilities dropped off a trailer full of donations on Thursday. It seems with each contribution comes a reality check. “We take for granted everything we have,” Musto said. “I can’t imagine what they’re going through,” said the Pelham Elementary Principal Tom Adamakos as he carried a box into the camper. But they’re doing all they can, packing this home with a powerful message for Texas. Dempsey starts the 29-hour journey to Houston on Friday morning. By Sunday, one family will have a new home and all the extra donations will go to shelters in the area.